When the 1966 Mercury S-55 was created as a close cousin to the 7-liter big block Ford Galaxie 500XL in 1966, it became its own model series for the first time. The Lincoln-Mercury Division of Ford Motor Company had been marketing the Mercury Special series as a sub-category of Mercury’s Monterey model. But in 1966, the Mercury S-55 became its own model series. It was a full sized luxury car with unmatched performance capabilities. 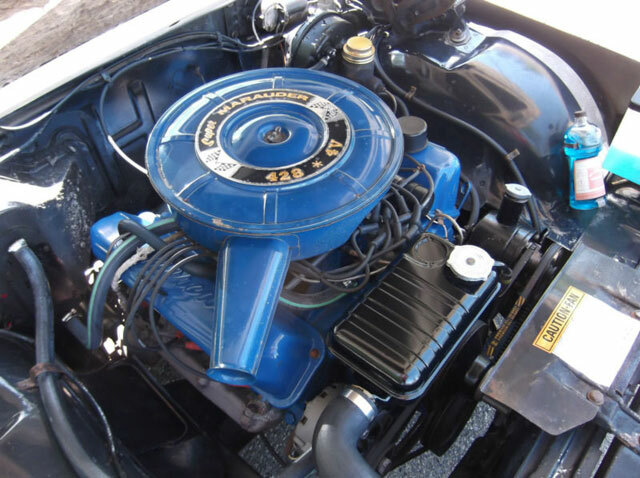 Yet, unlike Ford’s Galaxie, it only came with one engine choice … the 428 ci Super Marauder big block motor, a legendary performance brand. 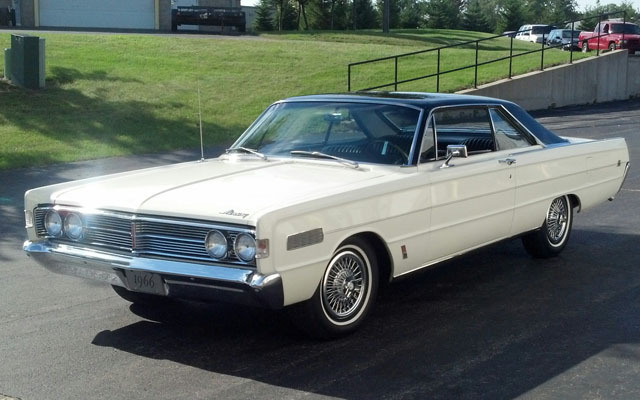 This week, a private seller from Woodstock, Illinois is offering his low-mile 1966 Mercury S-55 2-Door Hardtop for sale. The 1966 Mercury S-55 2-Door Hardtop is a little known side story to the muscle car era. The take away here is that this car is offered at a collector value way below the price of a 7-liter classic Galaxie. (Follow this link to find out more about the price on this 1966 Mercury S-55.) I think you will agree that this one is a lot of car for the money. This ultra rare 1966 Mercury S-55 is quite possibly the cleanest, lowest mileage and most well preserved S-55 on the planet. With only 6,794 actual miles, it has quite an interesting story and has the documentation that a collector would want in a period muscle car. It was originally owned by an elderly Southern gentleman who pampered the car from day one. You can tell how important low miles are to a collector car. All the rubber items are soft and pliable with no signs of deterioration. Carpet, door panels, headliner, padded dash and sill plates look absolutely brand new, according to the seller’s ad description. The S-55 was Mercury’s play for the youthful market where high performance was as important as luxury options. Make no mistake, though, there were 50 fine luxury options available including power disc front brakes and 6-way power seats. This 1966 Mercury S-55 has them. It also came with power steering, but no air conditioning. Among the important options were factory seat belts, remote mirror, courtesy lights and original floor mats. This car has a dealer installed radio reverberator with stereo sonic sound, and factory front and rear speakers. It featured a special type of fabrication using what were called Torque Boxes. The frame was tuned to minimize noise and rough roads. With a 123-inch wheelbase, the car extended 220 inches long, a true full sized car for the luxury car buyer. There were only 2,916 of these 2-Door Hardtops (fastback look) produced in 1966 and it was the first year the S-55 was a stand alone model, no longer considered a Monterey. It is powered by the 428 Super Marauder 4-barrel and was rated at 345 horsepower. Styling accents include unique body side-striping, deluxe wheel covers and the distinctive S-55 emblem on rear quarter panel and 428 V8 emblem on the front fender sides. This was the first year you could buy the Special or S model Mercury with only one engine offered, the Super Marauder 428 ci V8. The S-55 Super Marauder package included dual exhaust as standard. The interior of the S-55 was significantly improved in 1966. Bucket seats, Multi-Drive 3-speed Merc O Matic transmission with floor mounted console shifter were youth oriented features. The carpet, door panels, headliner, padded dash and sill plates look absolutely brand new on this unique well preserved Mercury collector car. Collectors will be impressed with the provenance and documentation on this car. It comes with a service manual, owners guide, original window sticker and a build sheet. 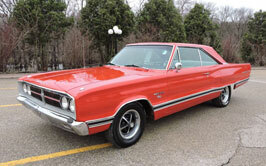 This 1966 Mercury S-55 Hardtop is the feature car in this week’s Cars-On-Line.com newsletter. Click here to read about it.